Peace and justice are no longer viewed as mutually exclusive. Establishing sustainable peace requires addressing injustices and combatting the culture of impunity. The proper application and sequencing of transitional justice tools enable peace and justice to augment each other. This chapter discusses this inherent connection between peace and justice in light of the intervention of the International Criminal Court in the Israeli-Palestinian conflict. It is difficult to categorically measure and conclusively assert the impact the International Criminal Court’s investigations and prosecutions could have on the conflict before the Court finalizes the intervention. 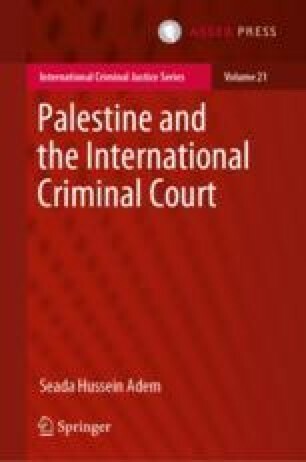 In comparison with other situations the Court has dealt with, this chapter addresses potential impacts of the Court’s intervention on combating impunity, the statehood question of Palestine, the stability of the two nations and the credibility of the Court itself. Taking note of the often raised claim that prosecution of alleged crimes committed in the conflict would disrupt peace settlements, the chapter also examines the pros and cons of establishing accountability on peace efforts. Azarova V (2015) Palestine’s day in court? The unexpected effects of ICC action. https://al-shabaka.org/briefs/palestines-day-in-court-the-unexpected-effects-of-icc-action/. Accessed 28 May 2017. Dancy et al. (2015) The ICC’s deterrent impact – What the evidence shows. https://www.openglobalrights.org/iccs-deterrent-impac/. Accessed 20 May 2017. Jo H, Simmons BA (2014) Can the International Criminal Court deter atrocity? https://www.ipinst.org/wp-content/uploads/2015/03/Simmons_Paper.pdf. Accessed 20 May 2017. Kontorovich E (2014) Politicizing the International Criminal Court. http://jcpa.org/politicizing_the_international_criminal_Court/. Accessed 5 April 2014. OTP (2003) Paper on some policy issues before the Office of the Prosecutor. https://www.icc-cpi.int/nr/rdonlyres/1fa7c4c6-de5f-42b7-8b25-60aa962ed8b6/143594/030905_policy_paper.pdf. Accessed 10 February 2017. OTP (2007) Policy paper on the interests of justice. https://www.icc-cpi.int/NR/rdonlyres/772C95C9-F54D-4321-BF09-73422BB23528/143640/ICCOTPInterestsOfJustice.pdf. Accessed 10 February 2017. OTP (2015) Report on preliminary examination activities. https://www.icc-cpi.int/iccdocs/otp/OTP-PE-rep-2015-Eng.pdf. Accessed 10 February 2017. OTP (2016) Report on preliminary examination activities. https://www.icc-cpi.int/iccdocs/otp/161114-otp-rep-PE_ENG.pdf. Accessed 20 June 2017.